We bought our house in 1998. 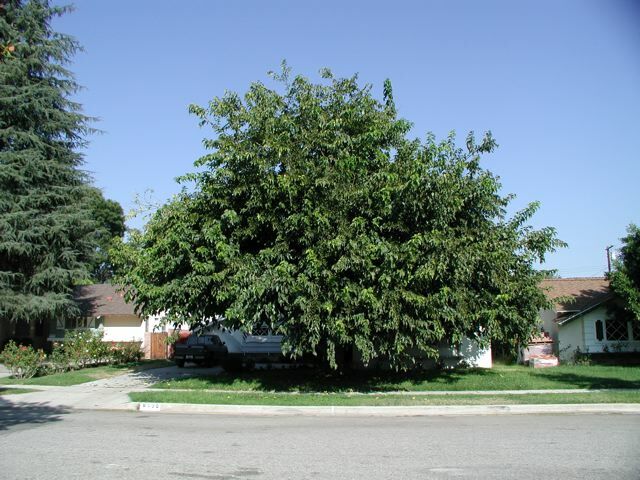 It was white with light grey trim and had a big Fruitless Mulberry tree in the front yard. After a couple of years, the tree tried to eat our house. So we removed the tree. And got a new garage door. 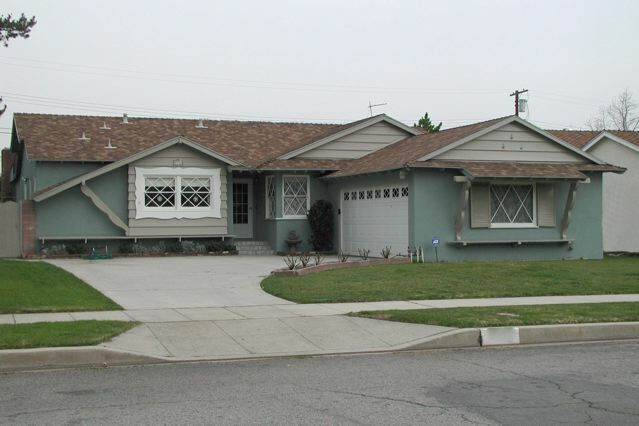 In 2003, we had it painted green, with taupe trim. Green was no longer my favorite color, but was a very acceptable exterior house color for someone who likes "color". 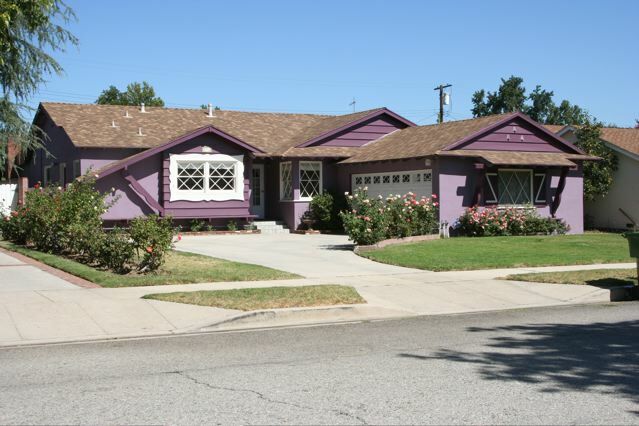 For years I had told Marshall, "You know it's only a matter of time before we paint the house purple." In 2007 the house was due to be re-painted. And to my extreme surprise (because I never actually believed it would happen), Marshall said, "Ok, let's go ahead and paint the house purple. Do it quickly before I change my mind." And after about a week of being in shock, Marshall and I decided that we love our purple house. Though I think it took slightly longer for our neighbors to reach that conclusion. Recently it was time to repaint our purple house. Of course we were going to keep it purple! We've had the same painter for over 10 years. He's the one who painted it purple in the first place. He's from Korea and is a 5th degree black belt in Tai Kwan Do and a 3rd degree black belt in Hap Ki Do. When he arrived in America over 30 years ago, he joined the U.S. Olympic Team and became an Olympic Champion. Why is he now a painter? Because he was the first born son and in his culture, he was given the option of joining his father's painting company or being disowned by the family. His younger brother started his own Martial Arts school and our Jason helps out with it, as well as participates as a judge during competitions. His reasons for being a painter make me sad, but due to his personality and commitment to martial arts, he is one seriously perfectionist painter. And he does tile and moulding too! Since our kids are Kung Fu trained, and our oldest son Haven is almost a black belt, it was indeed an honor for Haven to spar with Jason, our painter in our home dojo. Jason is 50 and can still do splits and roundhouse kicks like nobody's business. Over the years since Haven has been studying Kung Fu, Jason has always taken the time to watch his forms and give him tips. He's pretty awesome. With the house, we decided to do a couple of things different this time. We chose a purple that was one shade lighter for the stucco than the previous color, for more contrast between the stucco and trim. Also, for a few years I've been saying to Marshall... "If only we could find a way to add glitter to the stucco." Marshall would roll his eyes, but when it was time to repaint the house I brought it up again. He said, "No way!" and then compromised and said I could have a purple glittery front door. My response, "We can't have a purple glittery front door! Our front door has to be white, like the windows, for contrast against the purple!!!" I dropped the subject. A few days later he said to me, "Okay, if Jason can do it, you can add glitter to the stucco." WOO HOO!!!! So Jason came over to get the new color swatch for the stucco and to discuss repainting the house. I told him I wanted to add glitter to the stucco. He had to pull out his smart phone and find out from his Korean-English app what "glitter" was. Guess in the 30 years he's been here, he's never had to learn the English word for "glitter". As soon as he learned what it was, he looked up at me like I was joking. He said, "I've never done that before." And I placed my hand on his shoulder and said, "Just think Jason, after this project, you'll be a master at it." And he said, "I'm not sure I want to be a master at it." Jason knows I'm a little crazy. He's been painting for us for over 10 years. I told Jason I wanted clear, iridescent glitter added to the stucco. Then Jason did a series of patches, with various techniques, etc. before finding the best way to add it. The winning technique? When adding the second coat of paint on the stucco, he would blow the glitter on the wet paint with an airbrush machine. He used eye protection but apparently one piece of glitter still got in his eye during the project and he had to go to the eye doctor. But he didn't complain. And he got into it by the end, even adding glitter to the three triangles above the garage window, and he put double the amount of glitter in the entryway so it would sparkle even more. He repainted the cement floor of our patio (dark purple) and added two kinds of glitter to it. And guess what? Our whole family loves it. Even Marshall! I've had 3 different neighbors walk over to our house and tell us how much they like the glitter, and they were all men! Our Harley riding, Hummer driving 6'4 next door neighbor said he thought it was the best house paint job he'd ever seen. (and went in to say how pretty it was at various times of the day) Since then I've heard that other people on our street also enjoy driving by at various times of day to see it sparkle. It really does sparkle like diamonds. I love it. So the finished result??? 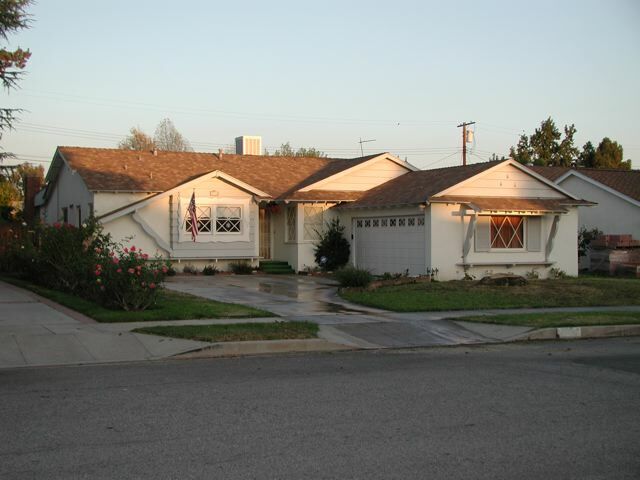 Here is our house with the new paint job. Oh, can't see the glitter? Well you need video for that. Here's my reaction to seeing the entry way glitter for the first time, before they were finished with the house. I don't know why my husband lets me do crazy things like this, but I think there's nothing wrong with adding a little more "fun" into your life. And for us, that means having a purple sparkly house. Yeah, I'm a little quirky. But I always have a smile on my face when I back out of my driveway or pull into my driveway and see my purple, sparkly house. The fact you live in purple house is one of the things I love most about you. It's just so quirky and shines with personality. Love it. I love your purple house! That tree! It is enormous! The trees are starting to eat our house too. I love your purple house. Great photos Julie!!! And I love the Z design you did on the front shutters like the ones on the old garage doors!!! I love your purple house! it looks like a perfect gingerbread house. and oh that TREE, that's hilarious..it really does look like you're about ot be eaten! Your house is so you...and that rocks...and I loooooooove it! It's way cuter in all it's purpleness, too...you made the right decision, fer sure. In our old neighborhood, there was a pink house. And an electric blue house. But no purple houses. In a city near ours, someone painted thier house green with purple polka dots to make a statement against the Home owner's association. That picture of the tree eating the house cracked me up! You can barely see the house! Of course if you had left it and painted the house purple first you could have really shocked the neighbors! 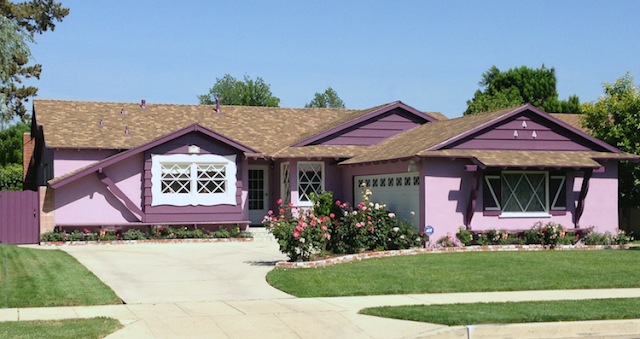 The town where I go to school in has a historical district, and one of the house is a totally 90s mauve. I can't tell if it's painted that way because the owner liked it, or because that's the historic color of the house. Because he's had on the market for years and hasn't been able to sell it (I have a feeling he has it priced way too high, because it's a pretty house despite the color). The house next to it is purple though, and it looks much better. I think your purple house is awesome! I just love the color! The pic of the tree eating the house is great. I think it's cool! I'm sure our neighbors would think it strange. We live in one of those color coordinated subdvisions, we had certain colors we could choose from when building. I agree with Darcy! What a sweet compliment she left you and I can't say it any better. You forgot to mention that you now have purple hair to match your purple house! Great entry. It was wonderful seeing you guys on Sunday. And thanks for the Zoe pic! Hey there! I gave you a bloggy award today! Stop by my blog entry for today to collect! I love that purple house. You can come live with Lula and I in our pink beach bungalow when we're old ladies. I love the purple house and the pictures to show the journey towards purple! LOVE THE HOUSE! LOVE YOUR BLOG! Quite a transformation! So glad the mulberry tree was not successful in eating your house, LOL! I love the purple house. It's not like it's a neon purple-- it's a cool purple. Purple is good. Hot pink would have been too much, but purple is nice. I love your purple house!!! FUN!!! Purple is so in this fall. It's in for me every day, all day, all my life. Out of the 3 colors I see, purple is the house's color. You know how people have colors they can wear. This house wears purple well!! Oh I am so jealous! I would love to have a purple house. My monther in law actually did paint her little house lavendar. I loved it. Thank you Luella!! I never dreamed my husband would agree to it, and now we all love it!! WOW - HOW AWESOME! I would sooo love a purple house and sparkly one would be even better! Maybe one day I can convince someone I need to paint mine purple too. Thank you so much Faith! We are loving our purple house. Hope someday you get yours as well! Love your purple house *JEALOUS*! Like the colour contrast of the first painting better, but using the sparkles for the second painting likely makes them show better with the lighter contrast. My dad was a house painter. He did some amazing things too (specialized in old colonial restoration painting), but he never used sparkles. I love purple, and re-did my kitchen in a grape theme with purple as a definite accent(the counter-top was already a purle-maroon colour). Would paint the exterior purple, but have vinyl siding which has to be chemically treated first to take paint. So I've lots of purple flowers instead. Have a SPARKLY day!! Thank you Anon! Would love you see a picture of your grape themed kitchen! If you ever check back, send me a pic via email!! I just love your purple house. Purple is the color for royalty so I quess you are the Queen of your house. My house is purple on the inside. Most people thought I was mad when we started building and the colors began appearing. Once it was all finished and the builders debris gone most people who saw the house love it and like you thought I was brave and a little bit crazy. LONG LIVE THE COLOR PURPLE. There have been times people in our neighborhood and our painter have though I was mad for painting our house. But purple is fun and it makes me (and a lot of people) happy! We have tons of people drive by and take pictures of our house. I think it's just one more fabulous way to bring fun and color into this world! Thanks for your comment Sam! Two of my most favourite things...PURPLE and SPARKLES!!! I am very impressed! My favorite color is purple and I love your house - beautiful. My nickname is purpleone and I want a purple sparkly house too! Very cool!